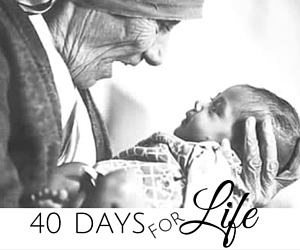 40 Days for Life is a campaign to end abortion. Volunteers sign up for an hour to peacefully stand on the corner and pray for an end of abortion. Vigil location: sidewalk in front of the Beltway Plaza, 7600 Belair Rd. We are also in need of people to agree to set aside an hour a week to pray from home. This is perfect for those whose schedule doesn’t allow you to participate, or are a bit uncomfortable with standing on the corner this year. For more information on prayers for each day of the 40 Days, please follow this link.